Rumors of tactical nuclear weapon detonation and related misinformation have plagued reports of Last Monday’s explosion in Donetsk, Ukraine. The incident had no casualties, unless you count 2 people killed during the shell fire that hit the city and started the fire at the chemical plant where the explosion later took place. Every report coming from the ground in Donetsk, including a bevy of independently uploaded eyewitness video, supports the official story being reported by CNN and other 24hour news media, that the explosion was the result of a chemical plant being hit with artillery fire from the Ukrainian Army. False reports of a tactical nuclear weapon detonation complicate political discussions in the short run and desensitize the public to the idea of nuclear war in the long run. Misinformation often abounds from war-torn parts of the world which is exactly why a skeptical, eye toward the data should be used. It’s especially important to rule out false conclusions if the conclusions imply the world somehow taking a nuclear assault with a grain of salt, which would be the case if all the major news outlets slept on the first nuclear bomb explosion in a combat situation in decades. As with any disaster, there was an opportunity for rumors and misinformation to take hold last after Monday’s independant reports, including video, began to surface. Three video examples below, combined with Ukrainian Army and Russia official responses, do not support a nuclear bomb explosion as correct interpretation of this disaster. 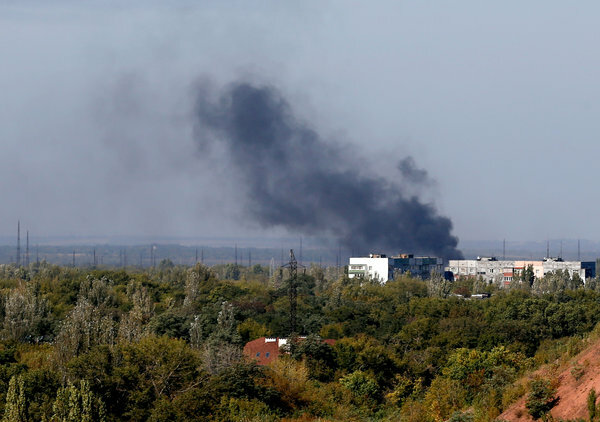 CNN reported the explosion as a fire at a chemical plant, a claim apparently originating from the local media in Donetsk. Pro-Russian Rebel spokesman Eduard Basurin was the official source claiming the chemical plant was hit by Ukrainian Army shelling. Ukraine is has yet to deny responsibility. The plant was not hit during hours of operation but the surrounding area was also hit with Ukrainian Army shell fire, killing 2 civilians. US-backed Kiev regime and the pro-Russian separatists accused each other of causing the explosion. The chemical plant seemed to be under control of seperatists at the time. Russian-backed seperatists and the Ukrainian Government have had repeated and worsening clashes over the last few weeks, despite talk of ceasefires. There have been over 5000 casualties since the separation war of Ukraine began in 2014. Pres. Obama’s statement on the matter: “Russia has violated every commitment in Ukraine” he said at the press event supporting this week’s visit from German Chancellor Angela Merkel at the White House. The public is debating whether or not the U.S. should arm the Ukrainian government to deter further Russian manipulation. President Obama has gone on record saying he wants to avoid that but implied it is not yet off the table. The EU member states are not all in favor of U.S. involvement. The volatile nature of the current talks are accented in a macabre way by the rumor of nuclear war. The EU has decided to delay sanctions against Russia to give ceasefire negotiations more time. If negotiations don’t achieve a ceasefire, economic sanctions against key Russian citizens as well as Russian corporations could worsen the already dangerous decline in Russia’s economy. 1. The upload timeline is too tight. Regardless of the size or nature of the tactical nuke, a nuclear attack would be chaos. It would be very difficult if not impossible to get any form of media recorded within a reasonable distance of the explosion. Local media covered the chemical plant fire within hours. Most of the videos published appear to be undoctored, eyewitness and posted within hours, sometimes minutes of being created. For the footage to be planned and released from so many sources, the timeline is too tight to be believable. If an actual nuke went off, there would be footage emerging from the area gradually for the next few days but electromagnetic disturbances and physical damage would stop anyone near the bomb site from getting internet access. The Ukraine revolution has been accompanied by a steady stream of media coverage at a grassroots level since it began. That would be put on complete blackout in the wake of a nuclear explosion. The story fell into speculation and misinformation mostly because there was a lack of data yet, that lack of data is the evidence that there wasn’t a “tactical nuclear weapon”, as versions of the conspiracy theory claim. A nuclear bomb would have spread data in various forms far and wide with an intensity that would enable scientists from around the globe to examine it. It would be virtually impossible to set off a nuclear weapon without various scientists around the world being able to verify it almost instantly; it’s been 2-3 days at the time of this piece being published. 2. Neither side of the Crimean conflict wants the area to undergo the aftermath of a tactical nuke. Seriously, the city and surrounding areas would not be livable. The internet isn’t the only thing that would not be reliable in a nuclear attack. The death toll would not be small news that leaked into the mainstream gradually over a few days. It would be thousands of human deaths and widespread environmental damage. he fact that people are still in the city of Donetsk, Ukraine shows that a nuclear bomb was not detonated in the uploaded videos. There wouldn’t be anyone close enough to video the incident who would then be alive to upload the kind of close-up video we’ve been seeing. Most of the people taking video and uploading it to youtube would already be succumbing to radiation poisoning if not destroyed entirely before they even had a chance to upload, even if they could get online. So, no, there wasn’t a tactical nuclear attack in Donetsk, Ukraine last Monday. It was an exploding chemical plant.